Recently it was our turn to do Caspar's school washing. While I was looking at the washing waiting to be returned I was thinking how cute and small everything was. Then it hit me. At home I have only ever provided Caspar with adult size placemats, napkins and cleaning cloths. I don't have much of a fabric stash but found enough fabric to whip up a few little napkins. This is about all the fabric I had. I really appreciate the diversity, it makes for a colourful collection. I buy bits of fabric I like by the fat quarter, I think I made four napkins to one fat quarter. I also cut down some of our placemats. These napkins are small enough to be folded in quarters. This made me think we have never done folding as a practical life activity. Perhaps today. I like them so much I might use them myself! They are also a perfect size for the lunch box. I was thrilled to find Montessori Print Shop featuring the train table turned wash table. If you haven't already click over to their blog article Washing clothes - Montessori style. The article contains some great information on practical life activities. Also I should have included the red Montessori style apron Caspar was wearing at the wash table is from Handmade Montessori Materials. I just love, love, love some of the fabrics Karla uses for her oilcloth aprons, it's the patterns - they are like of nostalgic. This train table was sitting unused in our garage. My husband cut out two big holes and inserted two basins to make a wash table. We are not having many nice days at the moment but when the sun comes out so does the washing. Rather than use detergent, Sunlight soap is much gentler on the hands. Yes, another reason to grate soap. I think it is fair to say that he is trying to master grating. A sensitive period for grating anyone? How did you install it? Where did you get the mirror? Is it shatterproof? I worry about our baby hitting it with her wooden toys. Maybe some sort of glue affixing it to a piece of plywood so if it break it stays put. I have often wondered how other people have done this. I don't remember where we originally purchased the mirror from as we have had it a long time. When we went to install it I went to our hardware store for advice. They recommended using silicone to attach it the wall being very safe and protect it from breaking, but using silicone would attach it to the wall permanently - which we didn't want to do. After some discussion we agreed on using mirror brackets which cover the corners of the mirror and screw into the wall. This is why our mirror does not have a frame around it (we removed the frame) so the mirror part sits flush against the wall. This also makes it much more difficult to break and the mirror is quite strong, so I have never been worried about it shattering. But affixing it to plywood is a good idea. Because the mirror is screwed to the wall with the brackets we were limited on the position of the mirror because some screws need to go into the wall beam (is it called a studd?) for strength. But of course this depends on the structure of your home/walls. Our mirror is so firmly attached that I have no concerns about it. However when we go to remove it we have a few screw holes in the wall to fill in. I think in the end we need to be absolutely comfortable there is not risk in it harming the child. I would have used safety glass/plexiglass if I could have easily found some locally. Yes, I have very often wondered how other people have installed their wall mirror. We all have safety concerns and budget concerns, each of us has different homes with different wall surfaces and different mirrors. I feel there is a lot of people looking for ideas for their mirrors. If you have installed a wall mirror I would love to know how you did it. I write this not because I am experiencing any particular difficulties but because I think it needs mentioning in this space. Parenting is hard. It's hard work. Sometimes it is difficult and I want to recognise that. Especially as Montessori parents we strive toward some kind of perfection that does not exist. Montessori mentions in The Absorbent Mind that mankind is drawn towards progression, towards better things. She also mentions in the section on character building that stronger personality types are attracted by perfection, drawn to perfection naturally, perfection attracts them because it is in their nature. I think all of us strive towards better things, to be better parents. We all want what is best for our children but I believe we need to keep our expectations realistic, perfection as parents is unrealistic, to provide a perfect Montessori environment or Montessori experience is unrealistic. It probably doesn't need mentioning, but if you do need reassurance be certain that we all have Montessori flaws, not one of us is perfect and not one of us is better than the other. At times we all find it hard! When we first started implementing Montessori principles in our home we really focused on the physical things, furniture, materials etc. It was only after time that I began to pick up on some of the other concepts of Montessori such as peace, respect and true love for the child. 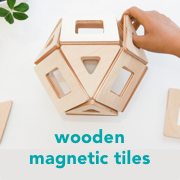 Here are my top five ways of introducing Montessori concepts into your home without spending a cent. "The child builds his inmost self out of the deeply felt impressions he receives, and this is especially important in the first part of his life" - Maria Montessori - The Absorbent Mind. I feel that a positive home environment should come naturally. However in our home it is something I reassess frequently. I strive for a home that is not overly serious and is filled with joy and playfulness. Remember this needs to be genuine, we can provide this stable environment even in times of stress. The beauty that Montessori was referring to was that of nature. We use natural materials and fibres when possible and try to look at our surroundings in a simplistic way. Beauty is not that of having a lot of things, it is having surroundings that inspire (you and the child) and promote a sense of well-being and calm. Montessori believed children (and possibly adults too) need direct contact with their environment and suggested long nature walks regularly. We try to follow this and take slow walks near our home. She suggests to put your self at your child's disposal, see what captures his attention, be guided by the child. This is on the list because it is something I struggle with. Montessori once said that interrupting a child is one of the most harmful forms of repressive actions we can take. At school, at home, doing puzzles or just putting on shoes - allow the child to concentrate, don't interrupt. Once I stopped interrupting Caspar I realised that most of the interruptions were completely unnecessary, unhelpful and didn't contribute towards him completing the task. If you have read this blog before you will know that I take every opportunity to allow my children to make a meaningful contribution to our family life. It is very empowering for a child to make meaningful contributions to their social groups including the family. There are so many ways that children of all ages can do this and most can be practical life exercises - watering plants, setting the table, contributing towards a meal. There are also many other principles which we strive towards. Some come really easy and others we have to work at, it's a journey after all! I have mentioned before how non-crafty I am. But I do think that every mother or child carer should make some effort. Craft has so much to offer. I do like activities that are simple, offer some learning experience and involve materials we already have in our home. Today we made soap balls. Caspar really likes this grater. Soap is really soft and therefore easy and fun to grate. Add lavender tea, chamomile flowers, pour in some water, a couple of drops of essential oil and mix. The lavender and chamomile were for different batches but oh well. Doesn't matter. This sensorial experience was a little too much for Caspar. After he mixed the ingredients together he was finished so I rolled the soap balls together. With our winter weather these will take a couple of days to dry out. Perfect for hand soap or as gifts. You could add dried herbs, other dried flowers or tea for variation. Our house now smells really nice and homely! We have had a lot of workmen at our home over the last couples of weeks. Mechanic, electrician, plumber, repairman. As you can imagine Caspar has been walking around the house pretending to fix a lot of things. Time for a real work bench and real tools so he can do some real work. To make his workbench we used the green table which has had so many uses around our home. Caspar used a screw driver to put together his wooden tool box you can see on a hook under the left side of the table. The only other activity we have for him so far is hammering nails. In case you are wondering about the cement floor, this is located in our garage. The great tool belt is an Etsy find, it's from dasBagsPlus, they take your child's waist measurement to ensure the belt fits exactly! I know you are going to love this as much as I do. An absolutely brilliant do-it-yourself Learning Tower. Charlene sent me these pictures of her son Clay who is 21 months old. Her partner Tasha built their very own Learning Tower using a shelf from Bunnings, a handsaw and drill, total cost around $60!!! Clay is able to climb in and out independently and the base can be moved up and down as he grows. It looks really sturdy and safe. Great innovation! Charlene is a trained 3-6 teacher living in the Hunter Valley (NSW Australia) and obviously knows the benefits of instilling a sense of independence in your child. Stay tuned as I hope to share more from Charlene soon. This is a short video of Otis batting at his bell on a ribbon at 10 weeks old. He is having some success in connecting with the bell! I know that cooking is a fun activity and there are so many ways your child can participate. But today my five things don't include cooking and are activities with food that are fun, quick, easy and not too messy. Cutting big shapes with cheese is easy and little shapes with carrot is more difficult. These carrot shapes would look so cute through a small salad. This tool is called a radish cutter, but we enjoy using it on cucumber. Carrot is a little more difficult and is best left for adults or much older children. This activity is challenging for Caspar and is most suitable for ages three and up. Even a five year old would enjoy this. The mortar and pestle are a favourite because Caspar (and possibly most children) likes bashing things. If I am using herbs, fresh or dried, Caspar will give them a bit of a crush first, it actually helps to release the flavours. Once again cheese is easy and carrot is more difficult. The softer the cheese the easier. This can get a little messy. There is still some cheese on my floor. Caspar had so much fun with this hand grater he grated much, much more than we needed, he didn't want to stop. I have mentioned this before, but I had to include it on my list. It is our all time favourite activity in the kitchen. No explanation required. Don't think this is too hard for a younger child. I have seen much younger children enjoy this. Besides the obvious aim of preparing food these activities also keep Caspar busy while I am cooking and allow him to make a meaningful contribution often to our family meal and therefore our family life. Many people would suggest having all the items required for each activity out ready for the child. This would work well for a younger child however at three Caspar is old enough to collect the items himself. As your child gets older do encourage/ensure they participate in all levels of the activity from set up to clean up. Allow the child to take ownership of the activity. A couple more of our favourite activities with food include juicing by hand and making melon balls. Please join in. What are your favourite fun activities with food? Do you like the Dancers Mobile? I think Otis does. Remember I mentioned we rotate the mobiles every two weeks or so to maintain the child's interest. Of course it isn't a necessity. But I am having so much fun and each mobile is so unique and so pretty. The dancers are made of really light paper so they 'dance' in the breeze and the holographic paper really gets the child's attention. I don't know the history of the Dancers Mobile, if you do please feel free to leave a comment. I would love to know more! This one is from Bella's Casa. New laundry hamper = new laundry helper. Although Caspar cannot read many words, he does know these by sight. Today Australia celebrates the Queen's Birthday and we have a long weekend. Some some special visitors came to stay, and they are Queenslanders! Caspar has been learning about Queensland for the last week so we decided on a Queensland morning tea. There are so many foods to choose from I think we will make it a tradition. A great hands on learning activity and who better to teach about Queensland than Queenslanders. Our dog is a Queenslander too but he wasn't invited. I have decided on a Friday Feature post, every Friday I will write a feature titled Five Things. This week is five essential items for the Montessori child. 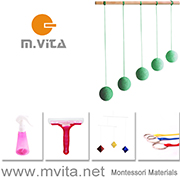 I am sometimes asked about what items we use most or what I would recommend to people starting out with Montessori. Here are my suggestions and our five essential items. Every child needs a table and chair at which they can comfortably sit, work and eat at. If you only purchase one thing make it a small table and chair. Small glasses from which to drink. Small jugs from which to pour. Small trays to carry. Little people will have greater success and more confidence working with items which they have control over or which fit in their hands. Every home with children usually has at least a couple of these. We have one in each bathroom, one in the pantry, one in the garage and a couple floating around. They can help your child reach light switches, door knobs, taps, higher shelves and reach a new level of independence. Aprons are so useful, not only do they assist in keeping clothes clean they also help a child know when work has commenced and concluded. A different apron for different activities would be ideal, think one for cooking, one for washing dishes, one for gardening. Hang them on low hooks near the activity. Purchase or make an apron the child can put on and take off themselves. There are so many ways your child can get involved in helping around the house. A child sized dust pan and broom is a good way to start. We also love our larger brooms, mop and carpet sweeper. Hang them on low hooks accessible to the child. Before you know it your child will be cleaning up after themselves and taking responsibility for their own mess. Please join in. What are your five essential items and what items would you recommend to families just starting out?